The Executive Plus Book Club – Phase Two is open to companies who attended The Executive Book Club – Phase One, as well as to companies who made bulk purchases of The Regenerative Business but have not yet engaged with the Phase One materials. You are starting to get the radical difference this approach offers. But there are more questions to get answered. You have been reading and getting excited about a fulfilling way of doing business and being financially effective at the same time. And as you continue to read and experiment, you will have questions galore. We have you covered! How would you like to engage with the author, ask those questions, and get her experienced reflection? Go deeper than the Executive Book Club – Phase One (and listen to both levels of recordings for up to a year). Here is the opportunity to ask your questions and learn more of what is behind the case stories in the book. The Regenerative Business Book Club we conducted on site moved our organization deeper into rethinking how we work than anything else we have done. It got people moving themselves regarding how to run a business, versus us telling them. Meeting to hear Carols answer to our questions was so illuminating. Having the author respond was really beyond what you ever get with a new book. The book and book club are recommended highly. The engagement guidance that you provided us [during the book club] was really helpful in terms of how to go about doing this work and ways of engaging with folks. This book club has been so impactful for me and the work that I do…. I would love to look at our system though this new lens with regenerative business and really do some of the things that you touched on. As an Executive Plus Book Club member you will have the opportunity to participate in nine more calls with Carol featuring your questions and her answers (spaced 6 weeks apart). Members will submit their new questions a week ahead of the upcoming call. 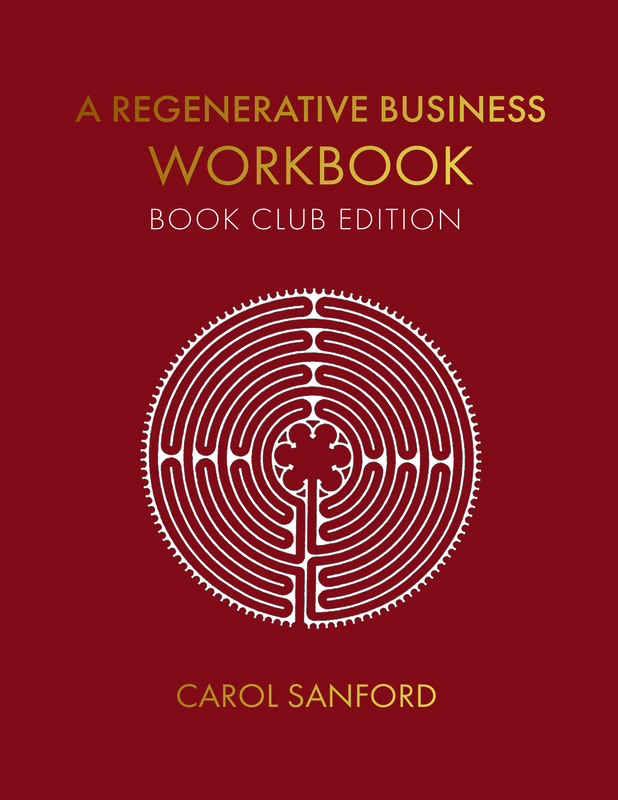 In addition, Carol will interview people with experience in creating Regenerative Businesses to share what they learned and discovered along the way. Plus, she will give her own second opinion in each webinar.Finally, you will have access to the recording of the nine events, AND the six webinars from Phase One, for up to a year. Whatever else you ask about! Recorded Interviews with leaders in the Case Stories in the book and beyond. They answer questions with Carol. Reserve your spot in the Executive Plus Book Club today for just $1197! Once you register, we will give you instructions for how to download the workbook and sign up on our membership site so that you can receive more information about the webinars. During each webinar, 10 attendees from each organization will receive new material, not found in the book, based on questions sent in advance by book club participants. There is time for reflection and questions to personalize the ideas in the book. The calls include participants from many companies and organizations who have the intention of implementing the ideas in the book. All calls are designed and led by the author, Carol Sanford. The calls are recorded and posted on our members-only website. Between webinars, members of the larger local, in-house book club will meet to continue to deepen their understanding of the material. Our Master Guidelines will help you get your onsite book club set up. Questions about the Executive Book Club, Bulk Buys, or more?